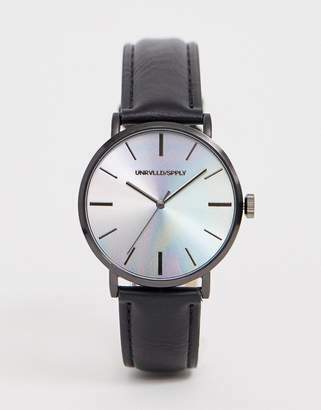 Watch by ASOS DESIGN, Something for your wrist, Faux-leather strap, Iridescent dial, Dash indices, Three-hand movement, Single crown to side, Pin-buckle fastening, Presented in a branded box. Giving you the confidence to express your individuality, ASOS DESIGN takes major trends, adding the freshest ASOS spin. All the gear you need including in our fit ranges Plus and Tall and our ASOS DESIGN Makeup collection to create your coolest look, then switch it up again tomorrow. Make every day, night and everything in-between as extraordinary as you are.